A huge thank you to Carole Avila for personally sending me this book in exchange for an honest review. Fifteen year-old Adley is on a terrifying journey! She has yet to learn that something sinister haunts her grandmother’s old mansion, or that it hides in a dark portal beneath her bed. The demonic being born of a generational curse does more than negatively affect Adley’s mood—it kills the first born child in each succeeding family by their 16th birthday—and Adley’s birthday is just around the corner! She meets seventeen year-old Victor Trumillo, a descendant of the original victim, and only he can destroy the hideous creature. Victor and Adley want to end the curse and save future lives, but will they succumb to fear just as they may have discovered real love? I'll admit I was rather shocked and also quite honoured when I received an email from Carole Avila asking me personally if I'd like to review her YA Horror Death House. I'd never had an author contact me personally before, so it did technically make my day. 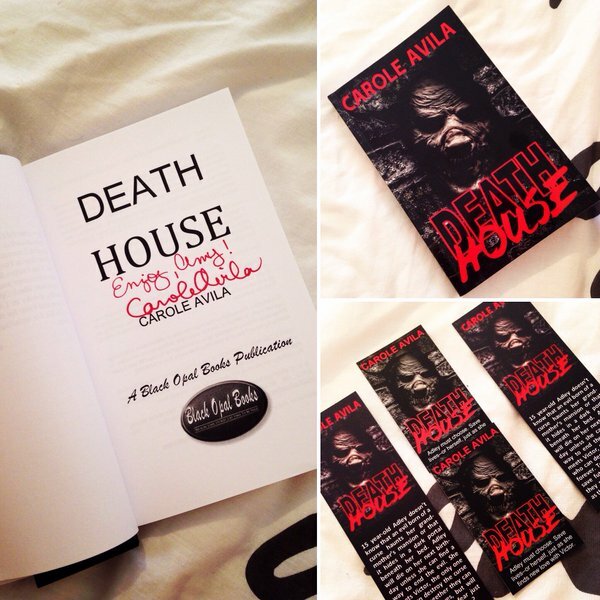 Obviously I jumped at the chance to read Death House and I was so happy when it made it's way onto my doorstep. I loved the fact that it was a signed copy too, made me feel slightly special. In Death House, Adley Lange is turning sixteen. Just before her birthday her parents move up to her deceased Grandmother's Mansion Capilla Manor, in New Mexico. After a few unexplained going on's, especially in her new bedroom, Adley, with the help of new friend and future love interest Victor Trumillo soon discovers that not only is Capilla Manor haunted but that the monster that lives underneath her bed is destined to kill her on her sixteenth birthday, all thanks to an ancient gypsy curses going back generations. Together, Adley and Victor are the only hope of ending the curse before her birthday rolls around. What I will say about this book is that it is very fast paced and it certainly keeps you on your toes. My heart was racing with each chapter and I admit I did jump slightly at times. It was like I couldn't stop reading as I just wanted to know what happened next, it was that endearing. The plot was really strong and I loved how the idea stemmed from a childhood fear of having a monster under the bed. I thought it was played out really well and it just shone through the movement of the writing and story. Adley, as a character really did annoy me at first. I found her to be obnoxious, bad tempered and just rather rude. However, as I got further into the book I started to warm up to her and I even started feeling sorry for her. I soon got the picture as to why she acted the way she did. For a horror I feel that Adley's parents added a slight comic relief to the story. I found myself chuckling and slightly cringing at their efforts to connect with and overprotect Adley. I'm sure we've all been there which made it all the funnier. It was light to a somewhat dark tale. I loved Victor! I just found him to be so sweet and willing to do anything for Adley. You could tell her just wanted to look after her, even after their first meeting when Adley wasn't rather pleasant towards him. For a horror, it wasn't as scary as I thought it would be. Like I said, I did jump at parts but I wasn't let's say scared out of my wits and I definitely don't have a fear of what could be lurking under my bed. I know some people may find it quite frightening though, especially if you have a fear of the supernatural. Death House was quite frankly, an amazing read. I was hooked from the moment I read the first page. It was fast paced, full of action, suspense and surprise with great characters to match. I am so glad that Carole took the time to contact me, as I wouldn't have discovered this epic adventure of a book. Wow! Thanks, Amy, for such an amazing review! I really appreciate you taking the time to read Death House. I am so glad you enjoyed it!